High heat returns to forecast today – Welcome to Wyandotte Daily! 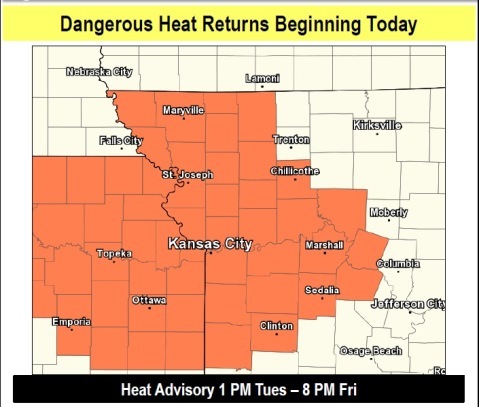 Wyandotte County will be under a heat advisory from 1 p.m. Tuesday, July 10, through 8 p.m. Friday, July 13, according to the National Weather Service. There also is an orange ozone air quality alert today, according to the Mid-America Regional Council. Highs in the 90s to around 100 are expected through this week, along with increasing humidity, the weather service said. 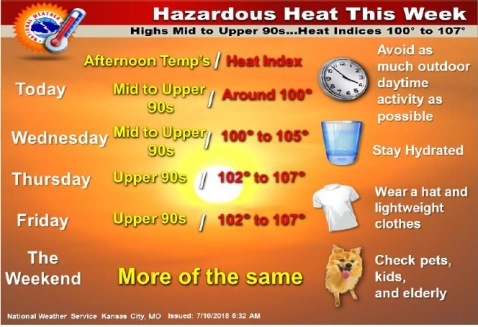 The heat index will climb into the triple digit range today, with readings reaching near to 105 Wednesday, and higher heat index readings on Thursday and Friday, according to the weather service. Little to no precipitation is expected through the end of the work week, the weather service said. The weather service said the combination of heat and humidity today could create a situation where heat illnesses are possible. Residents are advised to reschedule strenuous activities to the early morning or evening. 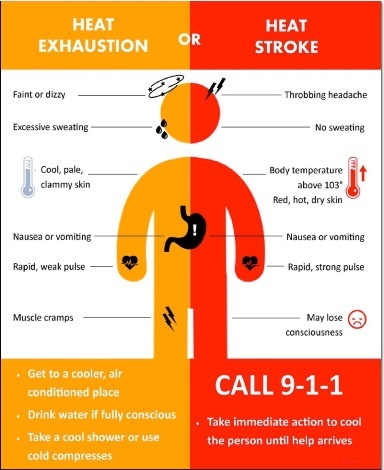 Residents should drink plenty of water, stay in an air-conditioned room as much as possible, check on the elderly and young children, and know the signs and symptoms of heat illnesses. During the air quality alert today, residents should avoid refueling vehicles or topping off when refueling, and avoid using gasoline-powered lawn equipment, according to MARC. MARC encouraged car pooling, biking to work, delaying or combining errands and using water-based paints and cleaners. Those who have respiratory illnesses should be especially careful. Bus rides are half-price, at 75 cents, today during the orange ozone alert, according to Ride KC. Today, the forecast is sunny and hot, with a high near 98, the weather service said. The heat index will be as high as 103. A calm wind will become east around 5 mph in the afternoon. Tonight, it will be mostly clear with a low of 75, according to the weather service, and an east wind of 5 to 7 mph that becomes calm in the evening. Wednesday, expect sunny and hot weather, with a high near 97, the weather service said. The heat index will be as high as 103. There will be a south southeast wind of 3 to 8 mph. Wednesday night, it will be mostly clear with a low of 76, according to the weather service. A southeast wind will be 5 to 8 mph. Thursday, it will be sunny and hot, with a high near 97, the weather service said, and a south wind of 5 to 10 mph. Thursday night, it will be mostly clear with a low of 77, according to the weather service. Friday, it will be mostly sunny and hot, with a high near 97, the weather service said. Friday night, it will be partly cloudy with a low of 77, according to the weather service. Saturday, expect mostly sunny and hot weather, with a high near 97, the weather service said. Saturday night, the low will be around 78 with partly cloudy skies, according to the weather service. Sunday, it will be mostly sunny and hot, with a high near 98, the weather service said. Sunday night, it will be partly cloudy, with a low of 76, according to the weather service. Monday, it will be mostly sunny, with a high near 95, the weather service said.